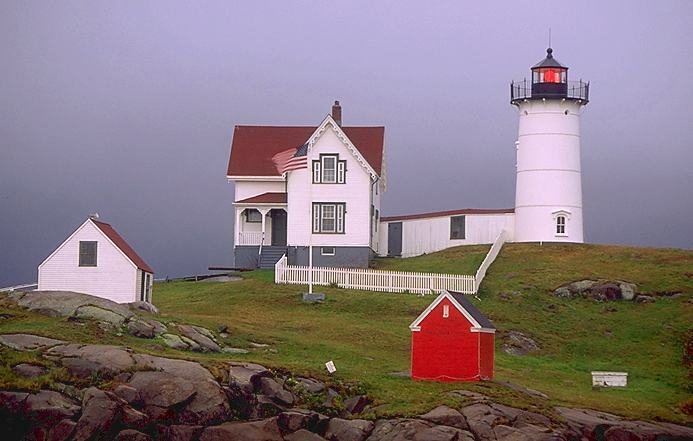 Built in 1879, Cape Neddick is the southernmost of Maine's many lighthouses. It is also called Nubble Light, refering to the barran rocky island (the Nubble) on which it sits, just off shore. The 41 foot tower is constructed of cast iron plates lined with brick. Cape Neddick's fourth-order lens flashes red every six seconds, and is visible for 13 miles. Cape Neddick is an extremely windy point, and viciously cold 100 mph winds caused problems with the flow of oil to the lamp for many years, until electricity came to the Nubble in 1938. It's easy to view or photograph the light from a vantage point at the end of Nubble Rd. out of York. There is a park with a clear view of the Nubble just offshore. It's tempting to cross over to the island at low tide, but signs clearly warn of the consequences. While you're there, plan to stop in at the Lighthouse Restaurant, where you can get a table with a clear view of the flashing red light only a hundred yards away. From Cape Neddick you can also catch a glimpse of Boon Island Light, nine miles offshore. In fact, if you look closely at the photo below, Boon Island's light is visible at the right side of Nubble, just below the clouds.